Antec Minuet-350 Slim Desktop Case w/350W 80PLUS BR PSU, Piano Black, miniITX/microATX, 2x USB3.0, 1x eSATA, 1x 5.25", 2x 3.5", 2x Audio. Haswell Rdy. 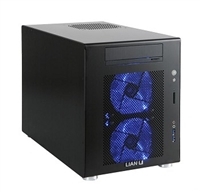 Lian-Li PC-V354B Aluminum Micro/Mini/DTX. Card Reader + Fan controls, 2x 120mm Blue LED, 1x 140mm. 7x 3.5" and 4x 2.5" HDD support w/cage. Lian-Li PC-C32B Aluminum 4U Rackmount ATX, Anti-Vibration Springs, Case stand, aluminum Switch Button, Anodized finish, 7 PCI Slots.